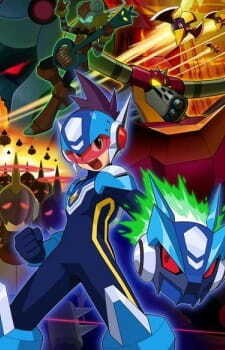 megaman starforce is an a very underappreciated, and often criticized, series among megaman fans. many call it a battle network clone, or state that it has a poor plot/development as a whole. however, i respectfully disagree - moreover, i'm going to review the anime adaptation of the first game. although i have a different approach to this series, being an avid fan of its characters, i really do suggest playing the game before watching the anime. the game is far more enjoyable. character: as far as character development goes, the anime adaption is fairly poor. the main character, subaru, is still given his respective treatment of depression after the loss of his father - however, his trauma is a bit downplayed in comparison to the game, making it less realistic and more so annoying at times. his companion, the class president luna shirogane, is terribly stereotyped - in the games, luna has an obvious crush on subaru, but this does not define her. whereas in the anime, she is almost ALWAYS trying to win over 'megaman's' affection, she even creates a rivalry with harp note/misora hibiki, someone she respects and BEFRIENDS in the games. as for the side characters, nothing really changes, since there not as important to begin with. however, misora hibiki, the popular pop-idol and roll/zero/protoman mix of the series, is drastically changed. although shes still enjoyable in the anime, her backstory is heavily toned down. (spoilers: her original reasons for becoming an idol deal with the loss of her mother. whereas the anime states that she just wanted to sing. which is fine on its own, but my point remains). however, like in the games, misora has more of a independent streak to her - she's able to hold her ground pretty well, and is willing to join the fight whenever she can. despite her slight flaws and somewhat forced romantic interest with subaru, shes still a good character. story: the adaption is rather... lacking in this aspect, but keep in mind that this is a kids anime primarily used by capcom to promote their new product/game. in essence, the story is changed completely from the game. subaru still has to fight the FM-ians, space beings that threaten to destroy earth, but instead of defeating them once, he faces them multiple times. in addition, the final antagonist is changed to (spoilers) gemini spark, an EM being that has taken control of tsukasa futaba, a young boy who befriends subaru. it should be noted that in the games, tsukasa is a FAR more complex character, as he suffers from multiple personality disorder. this is never mentioned in the anime, but is a major plot point in the games. tsukasa is also manipulated by gemini spark, but still has his own will, whereas the anime version has made him one being with a lack of empathy. in the end, its obvious that subaru, AKA megaman, saves the day - its your typical episodic kids show with a handful of filler episodes in-between, but in a way, it does develop characters such as the FM-ians. the game has never really provided these characters with personalities (exceptions obviously being warrock, subaru's partner, and harp, misora's partner, and gemini spark). its interesting to see characters interact in different settings, especially if these characters interested you while playing the game. art and sound: the art is, well, mediocre. its nothing impressive at all, and at times, looks rather bland. however, shingo adachi, one of the character designers for megaman battle network and sword art online, has animated or created the story-board work for some scenes. so you can look for some high-quality animation/art in between all of the basic animation. if you're a fan of the games, its something cool to see. as for the music? the openings are catchy as hell, albeit short. the music in the anime itself is also very good, but nothing too memorable. there's a few tracks i'd love to get a hold of, but sadly an OST CD was never released. (due to the show being so low in ratings). verdict: megaman starforce is a gem for its fans, but its nothing outstanding. while there are major differences from the core material, it is still enjoyable to watch as it expands on the personalities of its minor characters. the art isnt top notch, but you can REALLY tell when some of the animators pour their hearts out into some of the scenes. this series isn't for everyone, but its worth a try - each episode is about 9 minutes each, and if you're looking for some megaman action, its a pretty cute show with interesting designs. and, as a bonus, the second season has a lot of beautiful fighting scenes. The anime adaptation of Ryusei No Rockman/Mega Man Star Force stays closer to the plot of the games but with less episodes to do so with and ultimately suffers as a result. That said, even the Ace Attorney anime handled this detail better and even took its time to add to the plot. My rule always says to give a anime series at least 4 episodes before you can truly decide if a anime is good, meh, or bad. I gave this one 11 episodes before I straight out dropped it and this is coming from someone who has fully watched the Rockman.EXE series. I felt like Ryuusei no Rockman lost it's touch in the Rockman franchise as well as what made Rockman good to being with. Poorly design with a promising new beinging but producers failed to deliver it. Skip this anime if you are expecting something close to Rockman.EXE series because its completely different with a series of plot holes. I also promise you that you will spend a good 3-5 mins on the opening which gets quite annoying while the whole episode is only 10 min. long. Story (3): The story is broken into short action scripts from a couple episodes to the next. Art (5): Your average art, decent at most. Sound (4): I found the sound a little repetitive but bearable. Character (3): Almost all of the character are one-sided with no character development except for maybe the main character. Enjoyment (2): After seeing Rockman.EXE series, I don't think so.